Awash Wines 201 7 annual staff party celebrated on October 8, 2017 with theme of ‘New year new breakthrough’ that saw our staff taken several entertainments and multi sports events which really captured the essence of the day. Our Staffs were gathered from Addis Ababa’s Lideta and Mekenisa Wineries and Merti Jeju and it was fantastic way to celebrate the diversity of our teams and to experience new flavors. As part of the celebrations we had our first sport festival and on which several of our staffs took part and made fun out of it. Well done to Mekanisa Winery team for winning the Men’s Soccer Competition. 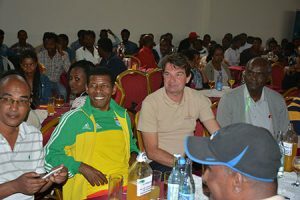 Ethiopian Great sports icons Haile Gebreselasse and Sewnet Bishaw were attend the annual staff party and hand over the prizes for winners of the Spots Activities. Congratulations to everyone who won awards, and to everyone who attended the annual celebration and dressed up in theme. It was great to celebrate our achievements together.